What can I say - It was love at first SIP. I had an instant attraction to your Claret, which I found to be very well-balanced and delightfully young at heart. Let's face it, you are very smooth and simply unforgettable. I think of you when were apart and look so forward the next time we can be together. Maybe it because of the sweet dark fruit and a good dose of oak, which I find so appealing. I know, I know this is stalker talk. When I leave you alone and let you breathe - you're even better. But it's hard to stay away for too long. Oh, I've heard the talk.. the awards...the accolades. I realize am not alone in my obsession and the bottom line is you get around. One thing I am sure of is if I don't quick, you're gone. I can't bare the thought. So as you are sold out between now and the 2008 release, I'll be coveting my 2007 stash. I may be obessed. The 2007 Horse Heaven Hills Claret (red wine) is a blend of 40% Cabernet Sauvignon, 20% Merlot, 20% Cabernet Franc, 14% Petit Verdot, and 6% Malbec. The fruit was sourced from our estate vines at Gunselman Bench, Andrews Horse Heaven Ranch, McKinley Springs and Phinny Hill vineyards. It was aged in 70% French oak and 30% American oak for 21 months, 50% of the oak was new. The ideal consumption is 2 to 5 years from release date, but this wine will develop for another 5-7 years. The alcohol by volume is 13.5%. This wine was bottled August 4, 2009. 2008 is Sold Out - but I've stashed away some to savor until the next release of the 2008. Ohh I learned my lesson after the 2006 sold out and I was left without. On ValenWINE weekend (the weekend before Valentine's Day) Robert Karl debuts the 2008 Claret and all is right again in a Locapour's world. Robert Karl Cellars is a boutique, Spokane winery producing handcrafted, premium, Cabernet Sauvignon, Claret, Merlot, Sauvignon Blanc, Syrah, and a dry Cabernet Franc Rosé. The grapes are from Horse Heaven Hills, an American Viticultural Area (AVA) of the Columbia Valley in Washington State by physician winemaker, Joseph Gunselman and his wife Rebecca. The winery produces 2,500 cases per year using fruit exclusively from the Horse Heaven Hills. Their winery and tasting room are located in an old fire station built in 1912 in the Historic Warehouse District. 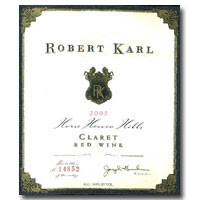 Robert Karl offers six wines each year, Cabernet Sauvignon, Merlot, Syrah, Claret, Sauvignon Blanc, and a dry Cabernet Franc Rose.